The Yes 420 Powder Hull takes the Yes 420 and adds the same kind of hull tech in the 2020 to make it a directional 2020. The 2019 Yes 420 Powder Hull has camber underfoot going to a powder hull in the tip and tail making it a very unique board. It feels almost like a camber board on groomers and then has float similar to a rocker board in powder. It’s very unique and turns better than the Yes 420 but isn’t quite there with the Yes Optimistic. Conditions: new snow but not a powder day. can’t win em all. Approximate Weight: Feels normal for its volume. 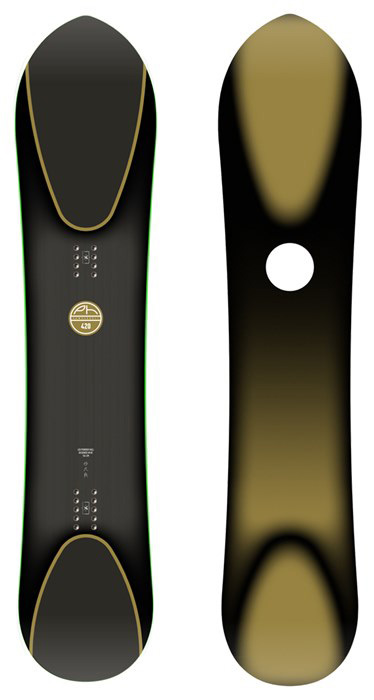 Flex: It’s pretty medium stiff across the board but on snow, it’s a little softer in the tip/tail. Sizing: The 154 feels a little wide but it for sure works for my size 9’s and I think it can handle a little bigger without it losing its overall short/medium-fat personality. Even though it’s a wide waist I wouldn’t suggest it for a big guy with a large foot though. On Snow Feel: The Yes 420 Powder Hull has an interesting ride to it and it doesn’t feel as disc-like as the standard 420. It’s a lot more fun on groomers but still is more of a powder board than, let’s say a board like the Yes Optimistic that’s equal parts groomer and powder. It’s got a stable feel underfoot but it doesn’t feel super forgiving and easy to skid a turn since it’s mostly cambered along the edges. It tracks well though along cat tracks like it’s almost a full camber ride, one foots super easy and needs a little attention to detail when skidding a turn. It’s not a mindless skidded turn like the 420 but it’s got a lot more personality when turning. Edge Hold: Pretty good grip that handles hard patches of snow pretty well. Turn Initiation: The Yes 420 Powder Hull isn’t super fast but it’s pretty good for what it is. It will turn a little quicker in powder than it will on groomers. Turning Experience: Here is the surprise. The Yes 420 Powder hull is no Yes Optimistic when it comes to making good turns but it actually does a great job for what it is when going out to make some groomers. I wanted powder but was happy I got to see how it turned on groomers. You can feel the part of the board along the edges acting like hollowed out camber if that makes any sense. If you ever tried boards with lifted sides it’s exactly the opposite. The middle feels empty but the sides are trying to act like camber and it almost pulls it off. There isn’t a washy weird feeling or a surprise where you feel like you have camber, commit to an edge and then realize you don’t. Instead, the ribbed camber holds enough to make it feel like camber but doesn’t feel quite as confident with soo much of the middle lifted far off the snow. Carving: Pretty good to carve but I’d take the Yes Optimistic any day over the Yes 420 Powder Hull. That being said I’d take the Yes 420 Powder Hull every day over the Yes 420. Speed: The lifted middle in the tip and tail makes the camber ribs chatter a bit but it’s pretty damp picking up some speed. Uneven Terrain: Not the board I want to ride in bumps or messy uneven snow but it’s ok for what it is. Powder: Unfortunately we didn’t get much powder but based on our experience with the 420 and more so the 2020 we all think this will float like a champ. Even with the limited stance options, there is still a 7.5″ set back on board with a 22.5″ stance width set all the way back which is pretty good for a 154 when it comes to directional float. Buttering: Not super easy to butter but doable. A little easier in the nose than the tail but overall ok.
Switch: I rode this switch a bit and again, it was doable but far from perfect. Jumps: Nice pop off the tail for most of the tail being lifted way off the snow in the middle. Pipe: didn’t even think about it but I’m usually not a fan of super fat boards in the pipe. Some might like it though. So overall, The Yes 420 Powder Hull was pretty fun and I think could work as a super fun quiver ride for many or even act as a full-time powder board for others. The biggest bonus is it’s pretty good on groomers compared to most true powder boards. We try to get as many images of the Yes 420 Powder Hull, but forgive us if they're not all there.